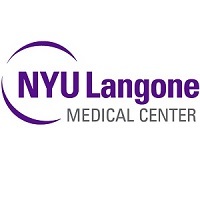 In the 2015 NF Education event at NYU Langone Medical Center, Dr. Thomas Roland, who is the Chairman of the Department of Otolaryngology, ENT, CI and ABI hearing implant surgeon, explains some hearing loss options including delay options to keep hearing longer, implants and the importance of watch and wait. J. Thomas Roland, M.D. : My name is Tom Roland. I'm the Chairman of the Department of Otolaryngology. I was interested in hearing and years ago when I was a fellow, I would encounter NF2 patients because they had hearing problems. It became clear to me over time that they had many more problems than just hearing problems. But my job was to try to solve hearing problems, try to prevent hearing loss, try to remedy hearing loss, et cetera. But also many of them didn't have a place to go to. I'd say who is your Neurologist, who is your Medical Doctor, your Ophthalmologist? Many didn't have those people and they were bouncing around. I tried to become a Primary Care Provider but I realized I was terrible at it. That was the evolution of the NF2 center here. 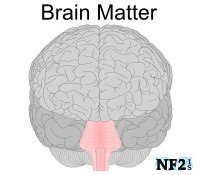 It became clear we needed a lot of practitioners who understood the special needs of all the aspects of NF2. That was when we went to administration and a few years later they agreed to help fund and to organize an NF2 Clinic. I'm going to talk today about how I used to think about NF2 and hearing and how I've changed the way I think about NF2 and hearing. We do receive a significant amount of research funding from these sources. A lot of this was already covered today and might be covered later. But we know the gene. We know the protein defect, MERLIN. 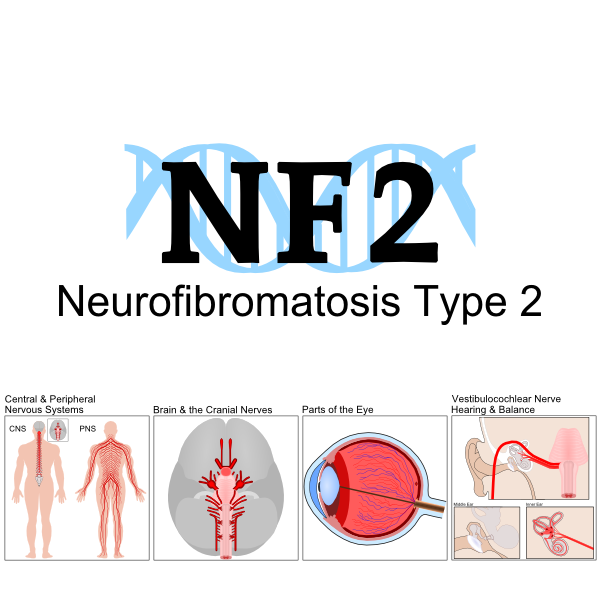 Schwannomatosis is a little like NF2. Some of the things I say today will also apply to Schwannomatosis patients. We also know this gene is also involved in many other diseases, both malignant and nonmalignant. We know the gene was cloned and we know the protein, the defect MERLIN. 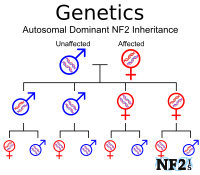 With that information, the evolution of understanding genetics of NF2 and of the drugs that we might use against NF2, have evolved more rapidly. There are diagnostic criteria, both the Manchester and the NNFF (National Neurofibromatosis Foundation) Criteria. Basically it defines NF2. But the whole arc is Bilateral Vestibular Schwannomas which is why patients have hearing problems. Despite a similar gene, and we learned earlier there are similar types of genetic defects, that might predict the phenotype. But as Amanda said earlier, why in the same family with the exact same gene you can have different presentations? It became clear to me these were some of the things people had small tumors, people had large tumors, people had good hearing in one or both ears, poor hearing in one or both ears, there were some with bilateral tumors, some very young onset, and some I see that don't present until they're in their 50s, and have a different phenotype than someone presenting at age 6 with small tumors. When I first started with NF2 was watch and wait. We let tumors get quite big and operated when lesions were life threatening or dangerous. And when there were Cranial Nerve problems to overcome, mostly hearing, balance, sensation, all the other nerves that are in that area. We also occasionally employ the Middle Fossa Decompression, which takes pressure off the canal and buy more time with hearing. We used to think hearing loss was because the nerve was compressed or injured. But we understand more and more the nerve is still there and still working, but it might be the blood supply to the Cochlea. The hair cells can't function anymore. They lose their oxygen and nutrition from that. There's also some recent data from post mortem studies where there's been proteins in the cochlea that go away sometimes. In the early '90s the philosophy was why don't we not wait until they get big, let's go after them when they're really small and maybe have a chance of preserving hearing in the long run. That has happened and still happens today but it's very hard to talk to a patient with normal hearing and two small tumors and say let's take them out, maybe we'll save the nerves and get a Cochlear Implant (CI), and if you don't save the nerve you get an Auditory Brainstem Implant (ABI). You still have three shots. But also in many patients who have had spinal disease and other problems, maybe hearing isn't their primary concern and maybe just leave things alone until there is a problem. Just to understand a bit more, the Inner Ear just gives you information about rotation and acceleration, and that's it. 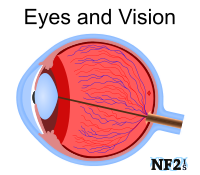 The rest of balance comes from vision and receptors in the muscles and joints. 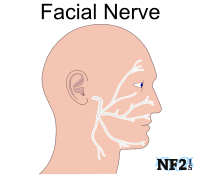 This is the Facial Nerve and this is the hearing nerve. A small tumor might start like this. We might say let's pluck that out, and save the nerve which is the goal of the surgery. As tumors grow, you can see the tumor is not in the cochlea. They get bigger and bigger. Once they get to this stage it's virtually impossible to save the Cochlear Nerve and maybe at this stage if we can get tumors this early, that's when we think about doing it. It's also when we think about taking the roof off this canal and letting it expand and have hearing for a longer period of time. I do have patients that have hearing years after you're not doing anything except relieving pressure. More recently in 2014, this is one of the problems with any of these paradigms, is that multiple tumors can occur in each of these nerves. Even some big tumors are collisions of some tumors. They're separate clones when you study the different areas of the tumor and they're separate Schwann Cells that went awry. And move at a faster rate. 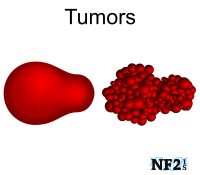 If you take out a small tumor and have a short success, but then within sometimes a short period of time, more tumors can grow, many Schwann cells are susceptible to becoming. You can preserve hearing, lose the nerve, and have no hearing at all. We talk to people about Speech Reading, we talk to people who have some hearing but might benefit from a Hearing Aid. And we talk about single sided hearing loss, bone anchored hearing aids and Cross Hearing Aids are options. We have cochlear implant, if we have a nerve still capable of transmitting a signal. ABI when there is no longer a hearing nerve. And we also have thinking about the midbrain, that's been around quite some time. Just to regress a little bit about how the ear works. Sound is picked up by the ears, transmitted to the drum. Goes to the bones of the middle ear to the cochlea which converts the sound to a signal that goes by the nerve and that's how the brain understands sound. We hear in our brain and the ear is just there to convert that signal into meaningful information so the brain can understand it. Problems from here out cause conductive or mechanical hearing losses and problems from here in cause the sensorineural hearing loss which is what most of our patients have. This is the central chamber. We call these hair cells. They have nothing to do with hair. They look like cells with little hairs on them. They take mechanical information and convert it to electrical signal. The cochlea is also organized to not opically (spelling?). Different areas of the cochlea move with different tones. Complex sound, this demonstrates different areas that might be vibrating. We take advantage of this with a Cochlear Implant because we can run it along there and access the different tones and different frequencies. We measure hearing with an Audiogram. Normal hearing is up at this level. Other levels are; mild hearing loss, moderate hearing loss, and moderate to severe hearing loss, severe, as well as profound hearing loss. And if it's off the Audiogram we call it a Dead Ear. Patients who get ABIs and Cochlear Implants are down here at this level, not enough hearing to amplify to get enough information to understand speech and language, oral language. So a Cochlear Implant takes the signal, does basically what the cochlea did, converts the electrical signal, sends it through the system and the implant is placed around the cochlea to try to access. The cochlear implant won't work if the nerve is not capable any longer of sending that signal if the nerve is either gone, absent, or not in good enough shape to get that information to the brain. So the brain stem implant then bypasses this and sends the information to the brain stem a little deeper in the ear. I was thinking about the patients and all their complicated issues, and how can I make sense of this and possibly advise them what to do? I went to a meeting in Australia in the early '90s and I was thinking about it the whole airplane ride over and writing out different paradigms and ways to present it. I came up with this algorithm of how we think about a patient. 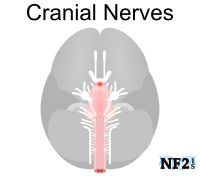 An NF2 patient has Bilateral Vestibular Schwannomas. They're in a hearing preservation category with good hearing and small tumors, or they're in the hearing preservation category where they have good hearing one side and small tumor, or they're in non-hearing preservation category. This group is probably the most difficult. This is the algorithm for that group. I won't go through every one of these details but let's just say you see a patient who has small tumors and good hearing on both sides and you talk to them and you operate on one side with the goal of trying to save hearing or save the nerve so you can get a Cochlear Implant. Let's say you save hearing. That's great. Then maybe they say you were good at the first time, take a shot at the other side, and think about a second side surgery. Or be conservative. If they do say go ahead and take a shot on the other side, now you have a patient with no tumors and good hearing in both ears. That's sort of a home run. Or if you lose some hearing, you can get a patient with a Cochlear Implant. You do have some patients with a Cochlear Implant after tumor surgery. You can go through any variation of tumor size and hearing, and some go on to get ABIs, if they lose hearing on both sides and the nerves are still present. The other hearing preservation I'm just reminding you these are surgical strategies. Before drugs we didn't have anything else to offer patients that were trying to think about hearing long term. So let's say you had good hearing in only one ear, and a growing tumor on the other ear, you might operate on the poor hearing ear and place an ABI. That's called a Sleeper ABI because you still have hearing on one side and are using the ABI on the other side. Most patients don't use or like the ABI because it's rather primitive. So they keep the ABI in place, may turn it on a few hours a day in the event that they will lose hearing in the other ear at some point and will go on and use that ABI. If you had a poor result with the ABI then you still have a second shot at it later when you operate on the other ear. So we like sometimes, we encourage people if they're going to have a surgery knowing it might be inevitable that they're going to lose hearing that they consider the ABI on the first side. The easiest algorithm with people with very large tumors and poor hearing to begin with, we operate on the worst ear and the most dangerous tumor, we place the ABI, when we have good result, and we'll watch them. If they have a poor result, we can operate on the second side. Other considerations where patients often present with prior surgery or treatment, but they will still fit into this algorithm somewhere. I haven't found a patient yet I can't put into the algorithm. There are still places that still like to radiate NF2 and patients get radiation. Sometimes radiation might affect the outcomes with Cochlear Implants or ABIs. Sometimes the target is distorted from scarring, tumor distortion, sometimes it's hard to find the target. These patients have needs ongoing, so they have to be MRI compatible in some way. We think of the overall health of the patient, and hydrocephalus (wrong word typed?). It's important to always counsel the patient's initial visit, to know all the options. The inter-auditory canal decompression can be a useful option to buy some time and long term planning is essential. Genetics sometimes help determine long term plans. They can sometimes predict the severity and patient course. It's expensive in 2015. In this study, I still think about this. This is a study from Manchester, UK. They looked at 433 families and found all these different types of mutations that exist. Amanda talked about some of them earlier. But importantly the truncating or nonsense mutations often have the worst prognosis. If you know someone with this mutation, you might think about how you're going to treat them or what you might offer them differently than if you have someone who has a different deletion. The missense mutation is the mildest form. You always want to discuss this with patients and their families. But everything you just heard is changing and is changing dramatically because of drugs. As you know, Avastin is probably the most popular, but there are many other drugs to see if they stabilize or shrink tumors or improve hearing. In the future, we as surgeons may become just Decompression or Debulking surgeons. I think Cochlear Implants which didn't have a big role in NF2 early on, may have more of a role going forward as we think about using these treatment paradigms. You all kind of know about this original article of just ten patients that happened to be treated off label with Avastin. And six of the ten had radiographic responses and four out of seven patients had measurable hearing improvement. And one had shrinkage in tumor volume. That opened the pathway to drugs. I'm going to present three quick cases that kind of have changed ideas of NF2 and hearing and how we think about hearing. This is the first patient, a 52 year old person, male, who had surgery elsewhere on his left side. Little bit of residual growing tumor on the left side. The only hearing ear was on the right side. His hearing is steroid dependent. It's hard to read but that's his right ear. Mild hearing loss, more profound in the higher frequencies and speech discrimination was variable. Speech discrimination is the other part of the hearing test that's very important. You present the sound above your threshold so you can hear it and then you measure how accurate you are on specific phonetically balanced words. We use these tests to determine whether a hearing aid would work. The cyst was growing and was pushing on his brain stem and we thought that's probably why he was losing hearing. He had been on Avastin for some time. 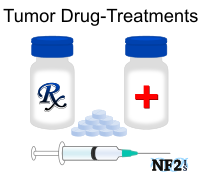 We thought about use different treatment options. Remove it, give an ABI. Should we just decompress it and continue on the drugs and see if we can help him? He opted for the decompression option. This is the big cyst, and this is the artery that goes to the cochlea. We drilled the bone off, decompressed the cyst, and the bone, and we were able to preserve the hearing. You can see this is Pre op and Post op. There's still some tumor there. He's back on Avastin. He had some hearing but it was improving a bit on Avastin. He has the potential for the Cochlear Implant as well even with the tumor in place. Second patient was a 24 year old male, his father passed away from NF2. He lost hearing at age 15 in left ear. He had a resection in 2005 but a post-operative hemorrhage. He wasn't excited about having the operation on the other side. The tumor kept growing. This was his hearing test. Mild to moderate hearing loss but zero percent word understanding, speech discrimination. You can see after 18 months of Avastin his tumor shrunk to half the size and word understanding went up to a hundred percent. We've never actually seen a result like this before this point in time. His hearing went to normal, to a hundred percent. It kind of defied what we thought about was going on with hearing loss. It's really not the nerve. It had something to do with the tumor effects and the disease effects in the cochlea. The last patient was 65 with NF2. Left tumor was resected outside. She came for drug trials here. The tumor was well controlled. We did a test where we test her inner ear with a needle electrode that stimulates it much like a cochlear implant would. Sure enough she heard so we gave her a Cochlear Implant on that side. And she's continuing on the drug and tolerating the drug quite nicely. This was her hearing Pre op. This is the best condition. Low frequency, but no high frequency hearing and very poor I think she had two percent word understanding, which means she guessed at one word and got it correct. The rest was off. She had a really good initial activation. She had good closed and open set speech. Open set means without looking at the person you can understand them. And she sent me a lovely email; I'm hearing my grandchildren again. Thank you very much. She's now about two years out with 70 percent word score and very happy. Her tumors are stable or regressing on Avastin and she loves her Cochlear Implant. There are a number of articles published with good evidence that cochlear implants now as part of the management for hearing and Neurofibromatosis is a reasonable option these days. Drug trials change the way we think of and manage NF2, and perhaps in the future think about unilateral Acoustic Neuromas. The question is why do some drugs work on some people and not others? Should we be using different combinations or cocktails of drugs or sequential drugs? And are there any markers to determine the likelihood of benefit? There are MRI markers that might predict the outcome of the drugs. Again I'd like to thank the multidisciplinary team. They've come a long way since I first started seeing patients with NF2 in clinic. It's really the patients that drive this work and our continued efforts to try to help patients with this disease.